If you’re out in the wilderness at night and without a compass, finding your way back to civilisation is still perfectly possible. What you need to do is find your way by the stars. This isn’t some obscure skill; it’s something mankind has been practicing for millennia. It’s a skill well worth having for everyone, not only for hikers, campers and climbers. It’s also a excellent way to come to know at least part of the night sky, which is a good thing in itself. The main guide for you – as long as you live in the Northern hemisphere - will always be the North Star, more accurately known as Polaris. Although you might not spot it immediately, there’s a very simple way to find it. The easiest constellation to locate in the night sky is the Plough, which is also known as the Big Dipper, since it looks like a saucepan. Find that and you can easily find the North Star. All you need to do is look at the two stars that form the side of the plough or pan away from the handle. They will always point at the North Star. Simply follow the line they make and you will see it. The North Star is the only star in the sky that doesn’t move. It will always be above the North Pole so that makes it reliable for finding north. From that you can easily find the other directions. If you’re not sure of your latitude you can discover that from the North Star, too. The star will be the same height above the horizon as your latitude. To determine what that is, make a fist and then stretch out your hand with the fist sideways. The fist is roughly equal to 10 degrees of latitude. Starting with the bottom of your fist on the horizon and work up to the star and you’ll have a general idea of your latitude. The constellation Cassiopeia is another good way to locate the North Star. It’s shaped like a ‘W’ (or an ‘M’) and can be found in the opposite side of the sky to the Plough. If for some reason you can’t see the Plough, Cassiopeia makes a good mark for finding the North Star. Remember that the stars move, and actually move very quickly. You can use that to figure out direction if you can’t locate the North Star for some reason. Locate two fixed points on the horizon and then a star that’s above them. If the star seems a little higher after a few minutes, you know that you’re facing east. Conversely, if it appears lower, you’re facing west. If the star you’re watching seems to loop to the right as it moves, that means you’re facing south. A loop to the left indicates you’re facing north. Rather than trying to learn all this when you’re out in the middle of nowhere, it’s a skill simply mastered at home. 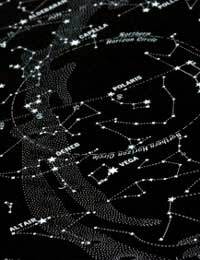 Go into your garden, or to a local park, and find the Plough, Cassiopeia, and the North Star. Given a clear night you should be able to find them within a minute. Once you have that knowledge you’ll be able to find your way by the stars no matter where you are.